Gift; Julia Parker Wightman, April, 1993. 168 leaves (1 column, 13 lines), bound : vellum, ill. ; 124 x 85 mm. on fol. 114v, kneeling at lower right before the Pietà is the figure of young man in armor, bearing a shield whose heraldry is repeated at other intervals in the manuscript (quartered shield, black eagle with red wings on silver ground in 1 and 4, 4 squares alternating red and silver sprinkled with white dots in 2 and 3, additionally on fols. 13, 81, 143); on folio 115 directly above the text, the initials L P encircled and intertwined by a red cord; purchased by Julia Parker Wightman from Harry A. Levinson, Beverly Hills, CA, in 1951; JPW 1323; given in April, 1993. 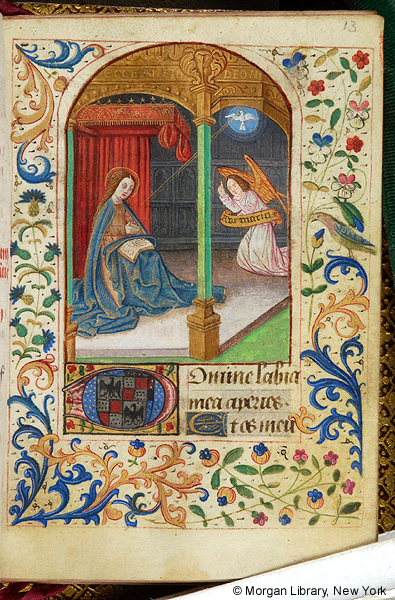 Ms. book of hours, use of Rome (Hours of the Virgin); written and illuminated in France, 1450-1475. Decoration: 2 full-page and 2 large miniatures, 1 historiated initial. Binding: Belgian 19th-century russet morocco, blind-stamped, signed Dewatines, in brown oasis solander case by Julia Parker Wightman.